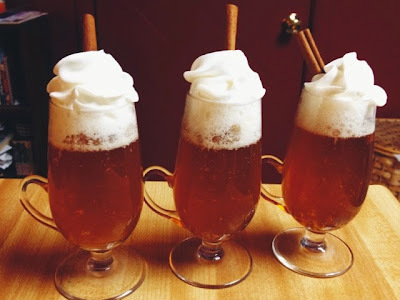 I'm always looking for things to celebrate and I really think we did National Mulled Cider day right yesterday. We started our day up at apple hill. Ate apple donuts, picked apples bought an apple crumble, etc. That night I decided to make spiked mulled cider after dinner. I just winged it as far a recipe goes, but it tasted pretty yummy so I thought I'd share. Pour 2 cups apple cider in a pot. We used an infuser for the spices, but you could just throw them in the pot and strain the cider into your cup. In the infuser I put 1 Tbs. whole cloves 1 Tbs. allspice and 1 tsp. lemon peel. Bring the cider to a boil and let simmer for ten minutes. In the meantime, fill each glass with a bit (I'll let you choose the amount of booze) of vanilla conac. Top off with cider. Add a dolup of whipped cream and a cinnamon stick. Easy peasy and it tasted yummy.